Yesterday the BBC posted an article about the ongoing war in the Middle East. I generally don’t trust the BBC as a source on the Middle East because I feel that they are biased against Israel, but in this case, the article provides a lot of good information. As you can see, the situation is a mess. The article was not about the map; however, the article was about a shift in the execution of the war by the pro-Bashar al-Assad forces in Russia and Iran. Russia’s defence ministry says it has used a base in western Iran to carry out air strikes in Syria. Tupolev-22M3 long-range bombers and Sukhoi-34 strike fighters took off from Hamedan on Tuesday, a statement said. Targets were hit in Aleppo, Idlib and Deir al-Zour provinces, it added. Local groups said 27 civilians had died. It is reportedly the first time Russia has struck targets inside Syria from a third country since it began a campaign to prop up Syria’s president last year. Iran is Bashar al-Assad’s main regional ally and has provided significant military and financial support since an uprising against him erupted in 2011. …Russia has been operating jets and helicopters from bases in Syria for the past year, but this is the first time that Moscow has deployed aircraft to a third country in the region. Reports indicate that up to six Tupolev Tu-22M3 bombers – known by the Nato codename of “Backfire” – are now operating from an air base in western Iran. These planes – originally designed as a long-range strategic bomber – have already been engaged in the Syrian air campaign but operating from bases in southern Russia. Placing them in Iran dramatically reduces the duration of their missions. The Russian defence ministry says that an unspecified number of Sukhoi-34 strike aircraft have also been sent to Iran. Their deployment marks an intensification of the Russian air campaign – perhaps a reflection of the scale of the fighting in and around Aleppo – and it is a demonstration of the growing warmth in ties between Moscow and Tehran, the Syrian government’s two closest allies. Also on Tuesday, Human Rights Watch alleged that Russian and Syrian government aircraft had been using incendiary weapons in civilian areas in violation of international law – something Moscow has denied. A review of photographs and videos indicated there were at least 18 incendiary weapon attacks on rebel-held areas in Aleppo and Idlib between 5 June and 10 August, the US-based group said. Witnesses and emergency workers reported at least 12 civilians wounded in five of the attacks. President Obama is in the process of forming an alliance with Russia to fight ISIS. That is a serious mistake. The only reason Russia is involved in this is to prop up Bashar al-Assad, to cement its relationship with Iran, and to regain the status it had as a world power before the Soviet Union dissolved. Vladimir Putin is not our friend and should be handled as carefully as a scorpion. PJ Media posted a story this morning about the military coup in Turkey last night. As I have previously stated, I was hoping that the military would oust President Recep Tayyip Erdogan and move the country back toward a secular democracy. Unfortunately, that did not happen. It should also be noted that President Obama supported President Erdogan rather than the military who were attempting to undo President Erdogan’s move toward becoming an Islamic state. However, there may be another aspect to this story that is not being widely reported. …Both Prime Minister Binali Yildirim and President Recep Tayyip Erdogan called into news programs and told their supporters to go out on the streets and fight back against the soldiers. A short while later, streets in the big cities (Ankara and Izmir) were flooded with Erdogan-supporters, who even climbed on top of tanks. Fast forward a few hours and it was officially announced that the coup had failed, and that Erdogan and his AK Party remained in power. About 1500 soldiers were arrested. The coup was staged by the entire military, which meant Erdogan’s chances of surviving politically were extremely small. The main argument against option number three is that there was some very serious fighting taking place, including massive explosions. Dozens of people have been killed. If this was a fake coup, it probably was the bloodiest one ever. That’s why many people are skeptical about this option, and believe it was just an incompetent attempt at a military takeover. The article also mentions the possible result of the coup. President Erdogan will undoubtedly move against those who were (or who he decides were) involved in the coup. He will consolidate his power and move Turkey closer to an Islamic state. It will be interesting to see what impact this coup will have on the recent agreement signed with Israel. Turkey is a member of NATO. At best, that is awkward for the west–as Turkey moves closer to being an Islamic state, that alliance is going to be severely strained. Of course we now have to see what Erdogan’s government will do. More than 100 soldiers involved in the coup have been killed, military commanders were taken hostage, and Erdogan has vowed revenge. As anyone with even a bit of knowledge of history knows, the crackdowns after a failed coup can be as bad as the crackdown after a successful military takeover. Erdogan already wanted to change Turkey’s constitution and change the system into a so-called presidential system, meaning most if not all power would reside in his office. Nobody doubts that this is exactly what’ll happen now: he’ll draw all power to himself and ignite a major cleansing, possibly not only of the military and police forces, but also in politics itself. The only possibly conclusion, then, is: no matter what, democracy will suffer a major setback in Turkey. We can only hope and pray that the consequences will be less severe than I fear. I don’t know if it would have made a difference if President Obama had supported the coup. It is interesting to me that he was ready to depose dictators when the Muslim Brotherhood was in the wings, but not when a coup might have resulted in freedom for the people of Turkey. The Wall Street Journal printed an editorial today about the ongoing relationship between President Obama and Iran. President Obama has two things he wants to leave as a legacy–one is ObamaCare and the other is a nuclear deal with Iran that lasts at least until he is out of office. ObamaCare will collapse under its own weight within three years, so that leaves the deal with Iran. In the negotiations with Iran, America has pretty much negotiated with itself–making concession after concession until Iran had no choice but accept the deal. So where are we now? So how did Iran respond? Last week Iran fired several rockets that landed within 1500 yards of the aircraft carrier Harry S. Truman. This incident occurred in the Strait of Hormuz. In October, the Iranians arrested Siamak Namazi, an Iranian-American businessman. He is being held without charges. The Iranians have held Washington Post reporter Jason-Rezaian for more than 500 days. Make no mistake–the religious leaders of Iran want a world-wide caliphate with Iran in charge. They need to get America and Israel out of the way in order to do this. The Islamic concept of ‘taqiyya’ is loosely defined as deceit or dissimulation toward infidels. The Iranians have used it masterfully in dealing with President Obama. On Tuesday, Hot Air posted an article quoting President Obama on the recent terrorist attack in Paris. President Obama stated that it will be a “powerful rebuke” to ISIS to hold the climate-change summit in Paris. Maybe it’s just me, but I think it would be a more powerful rebuke simply to blow their headquarters to smithereens. Asked Guy Benson, “Is he saying the climate conference is the rebuke to terrorists, or unbowed world leaders gathering in Paris?” The answer is both, right? Partly this is stiff-upper-lip stuff of the sort you always hear from a head of state after a major attack. “We refuse to be terrorized by terror, we will carry on as we always did,” etc. They had a conference planned, and no scumbag jihadi is going to intimidate them out of holding it. Fine. We need to continue with business as usual as much as possible, but to see any relationship between terrorism and so-called climate change is simply beyond the pale. It would be really nice if a group of pro-democracy world leaders got together to discuss how to protect western countries from ISIS and its terrorist buddies or how to wipe out ISIS, but I guess climate change is more urgent. I suppose it is purely coincidental that all of the solutions to climate change limit the freedom of people who are currently free and funnel money to third world dictators who have no intention of using it for anything remotely related to climate. There is a difference between cultures. Western culture, based on a Judeo-Christian ethic, supports the idea of helping your fellow human being in times of crisis. The Muslim culture has built into it the practice of jihad, which by its nature, does not protect innocent life or include the concept of helping those less fortunate. On Friday, the Center for Security Policy posted a list of reasons why Arab countries are not taking in the refugees fleeing northern Africa and the Middle East. Western countries quickly come to the rescue, open their wallets and land to prove to the world that they are not Islamophobes. There is more to this story. Pamela Geller is an expert who studies Islam and understands how the religion works. She posted an article on her website yesterday. In this article she points out that the majority of the refugees arriving in Europe and young men who are in good physical shape. I do not have a problem with taking in refugees. However, we need to make sure the refugees come with the understanding that they will need to assimilate and become self-sufficient–not live off of the American taxpayers. In the past when we have taken in refugees, we have not offered them welfare, and they have learned the language and assimilated. We need to understand that every refugee who comes to Europe or America from the Middle East comes with the idea of being part of western civilization. Townhall.com posted an article today about a young Mississippi couple who planned to join ISIS on their honeymoon, Thankfully they were arrested before they had a chance to carry out their plans. Now these two are facing criminal charges after being arrested in Golden Triangle Regional Airport in Columbus, Mississippi, this past weekend with accusations of conspiring and attempting to provide material support and resources to ISIS. “We learn very fast and would love to help,” the young couple told undercover FBI agents claiming to work with ISIS through social media messaging. …The couple derive from Mississippi, where Dakhalla is the son of a local imam and, ironically, Young is the daughter of a Mississippi police officer. The Daily Caller posted an article about a selfie that went wrong. In this case, wrong is in the eyes of the beholder–I think it went wonderfully right. Air Force Gen. Hawk Carlisle said in recent remarks that airmen at Florida’s Hurlburt Field were scouring open-source online feeds when they found a photo of “some moron standing at this command” and “bragging about the command and control capabilities” of the group. Don’t ever post anything on the Internet that you wouldn’t mind seeing on the front page of The New York Times. Islamic terrorists generally use social media very well. It is one of their prime recruiting tools and is also useful as one of their communication tools. There has been some consideration of making social media unavailable to terrorists, but aside from the obvious problems in doing that, in the case of the terrorist selfie, a terrorist social media post helped the western powers fight terrorism. We need to fight terrorism using every method at our disposal. The Washington Free Beacon is reporting today that Iran has increased its undercover activities in Latin America. And we are negotiating a nuclear treaty with these people? “We’ve seen violence and terror perpetuated” by those who distort their faith, he said Thursday morning to a group of 3,500 gathered in the Washington Hilton’s ballroom for the morning event. In seeking to reconcile these two realities, Obama urged humility for all people of faith, recalling that in the past people “have committed terrible misdeeds in the name of Christ,” including justifying slavery and Jim Crow laws. “There is a tendency in us — a sinful tendency — that can pervert and distort our faith,” he said. He urged every member of faith to speak up against those who would misuse their religions to justify murder and terror. If Islam is being distorted by those who persecute Christians and Jews, force people to convert to Islam, and murder innocent people in the Middle East and in Africa, why is Israel the only country in the region where Jews, Christians, and Muslims are free to practice their religion without persecution? There is a pattern here. The New York Post posted an article today about the planned prisoner swap between Jordan and ISIS of Muath al-Kaseasbeh, a Jordanian pilot, and Kenji Goto of Japan. Jordanian officials said would-be bomber Sajida al-Rishawi and other Islamic State fighters would be “quickly judged and sentenced” if Muath al-Kaseasbeh is killed, the Daily Mail reported. The deadline for a possible prisoner swap passed Thursday with no word from the Islamic State, also known as ISIS, about the fates of al-Kaseasbeh or fellow hostage Kenji Goto of Japan. I have very mixed emotions about this. If Sajida is released, she will probably attempt another suicide bombing (and this time the bomb may go off). She will kill herself and also kill innocent people. You may save the lives of the two prisoners by turning her over to ISIS, but in the process you endangered other lives–probably more than two. Another part of this dilemma is the fact that the only thing ISIS seems to understand or respect is force. If taking hostages turns out to be a losing game for them, rather than something that gets their soldiers back or raises money for their organization, they might turn to something else. Depending on exactly what that something else is, it could be either a good or a bad thing. On Sunday, the Department of Defense issued an announcement that they were releasing six Guantanamo inmates to Uruguay. The terrorists were Ahmed Adnan Ahjam, Ali Hussain Shaabaan, Omar Mahmoud Faraj, Abdul Bin Mohammed Abis Ourgy, Mohammed Tahanmatan, and Jihad Diyab. Yesterday, The Long War Journal posted some information on who these prisoners were. Syrian intelligence authorities under the Assad regime reported that Abu Musab al Suri, a senior al Qaeda ideologue, was the head of the “Syrian Group,” whose members traveled to Afghanistan for training in al Suri’s and al Qaeda’s camps. One camp established by al Suri, known as the al Ghuraba camp, provided training in electronics, including the building of improvised explosive devices (IEDs). See the article at the Long War Journal for further information. …Abdul Bin Mohammed Bin Abess Ourgy (ISN 502), a citizen of Tunisia, is the sixth and final detainee transferred to Uruguay. “Detainee is assessed to be a member of al Qaeda and a finance operative for the Tunisian Combatant Group (TCG),” the JTF-GTMO threat assessment reads. The TCG is a forerunner of Ansar al Sharia Tunisia, the group responsible for the Sept. 14, 2012 assault on the US Embassy in Tunis. And the intelligence collected on Ourgy showed that he worked with some of the senior TCG officials who would go on to form Ansar al Sharia Tunisia, including the group’s founder, Abu Iyad al Tunisi, and Sami Ben Khemais Essid, a longtime al Qaeda operative. The article has full biographies–this is just a snapshot. Traditionally prisoners of war are not released until the war is over. I am concerned about what sort of mischief these men will create in Uruguay and how long it will take them to rejoin the battle in the Middle East. Yesterday Andrew McCarthy posted an article at National Review Online about the Obama Administration’s policy toward Syria. In particular, there is the story line that Syria is really teeming with secular democrats and authentic moderate Muslims who would have combined forces to both overthrow Assad and fight off the jihadists if only President Obama had helped them. But his failure to act created a “vacuum” that was tragically filled by Islamist militants and gave rise to ISIS. At this point in the story, you are supposed to stay politely mum and not ask whether it makes any sense that real democrats and actual moderates would agree to be led by head-chopping, mass-murdering, freedom-stifling sharia terrorists. In point of fact, there simply have never been enough pro-Western elements in Syria to win, no matter how much help came their way. Any effort to pacify Syria will only result in events similar to what happened in Egypt. Actually, there no longer is a Syria–the Muslim Brotherhood, Al Qaeda, and their buddies do not recognize the borders drawn by western nations in the Middle East. 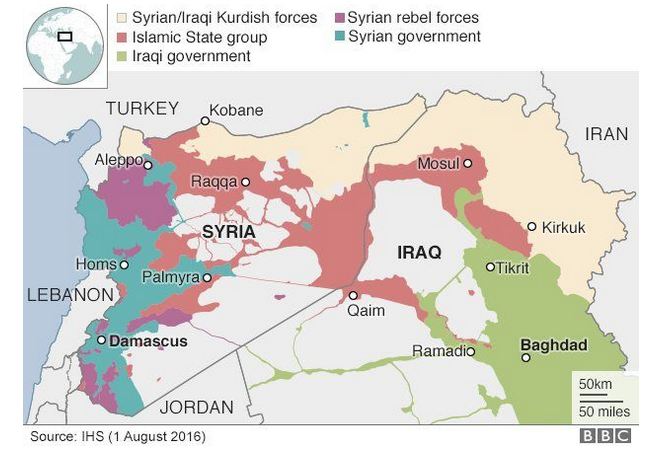 What is happening in Iraq and Syria is an attempt to combine Iraq, Syria, and Iran into a caliphate. America‘s involvement in the situation is helping no one. If there is a way to aid the refugees without sending troops, we need to do that. Sending troops to Iraq after President Obama squandered the victory that American troops had won is simply not smart.